Add your social buttons to let people know about your website and make it more visually appealing. We embedded most popular share services such as Twitter, Google+, Facebook, and more right into the LeTheme template and you don't have to install any third-party plugin to add this stunning feature. Just choose the icons to make sharing easier. 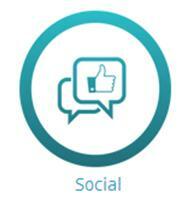 You can find out how to customize this element on the page Social Buttons.